The proliferation of digital tools, social media, and mobile have created a world of two-way communication with buyers that’s here to stay. To keep up, companies are seeking out marketers with digital expertise at an increasing rate, according to a recent study from McKinley Marketing Partners. The study, which surveyed over 300 marketers, reveals a healthy job market for the marketing industry overall, 19 percent growth over last year. 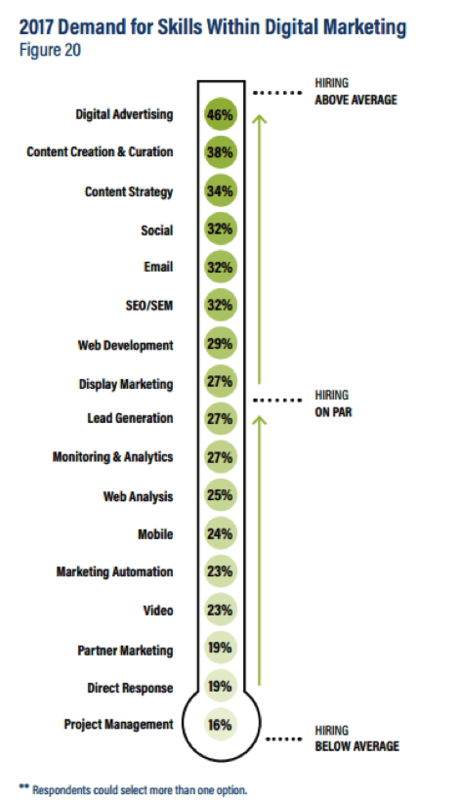 Additionally, 44 percent of those surveyed plan to hire more marketers this year compared to only 28 percent last year. Digital marketing continues to dominate with a projected 56 percent of hires requiring some degree of digital experience. Interestingly, 48 percent of requests for marketing talent received by McKinley Marketing Partners in 2016 required digital skills, and that figure is already on the rise this year. 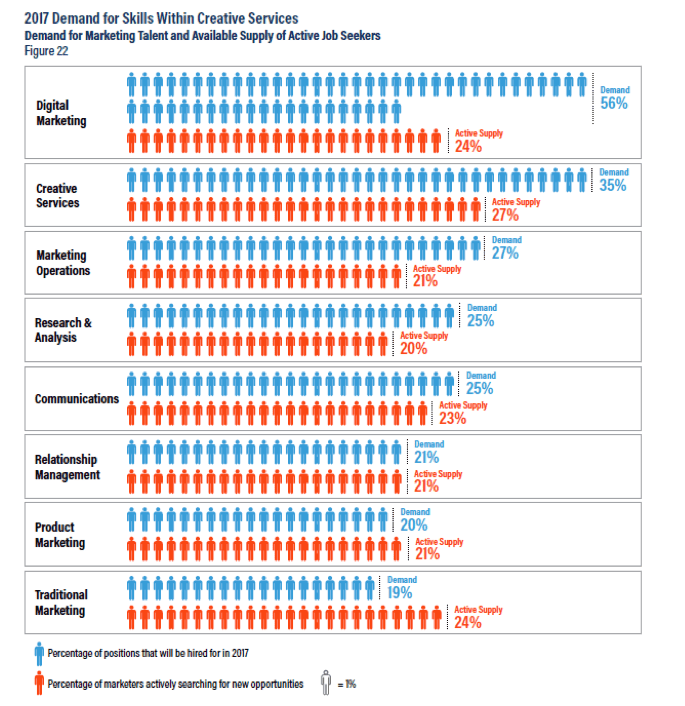 Creative services (35 percent) and marketing operations (27 percent) rounds out the top three most hired for positions in 2017. Among digital marketing skills, digital advertising (46 percent) and content creation and curation (38 percent), and content strategy (34 percent) are highest in demand. Social media, email, and Search Engine Optimization (SEO) were close behind, signaling the importance of an overall digital media strategy. Regardless of the job title or function, employers look for candidates with digital marketing skills. This is especially true within communications and creative services but is also important in specialties where digital has historically not been required such as in traditional marketing and market research. 2017 is a great year to be a digital marketer. As we alluded to earlier, digital marketing remains the most hired for area of expertise in marketing though only a fraction of digital marketers are actively looking for new opportunities. Meaning, they are happy in their current roles and can be very selective when considering something new. One the other side, hiring managers should always be looking for marketers with digital skills so they have a pool of talent to tap into when a need arises. Otherwise, they may have a tough time finding the right candidate on short notice. The hiring landscape among other marketing functions, though not as extreme, still presents challenges and opportunities for job seekers and hiring managers alike. sourcing and recruiting tactics to tap into neutral talent pools. Higher salaries, exceptional benefits packages and perks such as flex time and telecommuting can attract top-notch candidates. In situations where supply exceeds demand, job seekers should find ways to market themselves to potential employers and stand out from their peers. Marketers across all functions can strengthen their resumes and LinkedIn profiles by quantifying their impact. 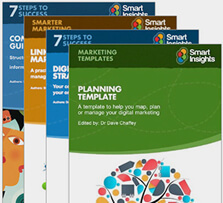 In all other marketing functions – communications, traditional marketing, product marketing, research & analysis, relationship management and marketing operations – the markets are mostly saturated. It won’t be hard to find a candidate but it may take time to weed through the excess to find the shining stars. Hiring managers should brush up on their interview skills – know what to look for and equally important, what to watch out for - and keep an eye out for marketers with digital experience to augment their teams. If you’d like to learn more about these and other marketing hiring trends download McKinley Marketing Partners’ free report.